She can never leave the cool world"
Dancing on Ashes (Welcome to) ist eine Performance Installation, die in das transmediale Multiversum von Angel Meat einführt. "Ines Birkhan and Bertram Dhellemmes present a composite work involving dance and music performance, video and staged literature. 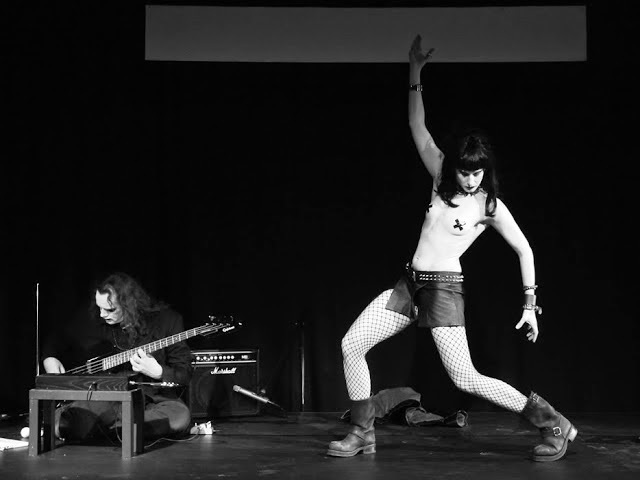 Though Dancing on Ashes (Welcome to) is a piece that stands for itself, it is also an opportunity to start the exploration of a work-in-progress that investigates through different medias the connections between experimental arts, pop subcultures and ancestral cathartic theatre." Eine Kooperation der Akademie Schloss Solitude und Kunststiftung Baden-Württemberg.